Husk and silk corn. Brush each ear of corn with some of the Italian salad dressing. Place corn on the rack of an uncovered grill directly over medium coals. Grill for 15 to 20 minutes or until tender, turning often. (Or place brushed ears in a shallow baking pan; bake in a 425 degree F oven for 30 minutes, turning once.) When cool enough to handle, cut kernels from cobs (you should have about 2 cups kernels). 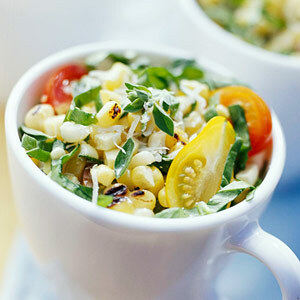 In a large bowl, combine corn kernels, spinach, tomatoes, and the 2 teaspoons snipped oregano or basil. Add remaining Italian salad dressing; toss to coat. Spoon corn mixture into six small mugs or bowls. Sprinkle individual servings with Parmesan cheese. If desired, garnish with oregano or basil leaves. Makes 6 servings. PER SERVING: 82 cal., 2 g total fat 2 mg chol., 326 mg sodium, 15 g carb. (3 g fiber), 3 g pro.